The org.orekit.time package is an independent package providing classes to handle epochs and time scales, and to compare instants. The principal class is AbsoluteDate which represents a unique instant in time, so as to be able to locate it with respect to the many different times scales in use in the space dynamics and astronomy fields. This greatly simplifies development as it hides some models internals. For example when using JPL-based ephemerides, time must be in Terrestrial Time (formerly known as Ephemeris Time). However, this is an implementation detail and someone calling Orekit from a high level application should not have to deal with it. The AbsoluteDate class allows users to pass a date regardless of the time scale it was defined in, conversions will be done as required transparently. this is the most accurate and regular time scale that can be used at the surface of the Earth. defined by IAU(1991) recommendation IV Coordinate time at the surface of the Earth, it is the successor of Ephemeris Time TE. By convention, TT = TAI + 32.184 s.
UTC is mainly related to TAI, but some step adjustments are introduced from time to time to keep take into account Earth rotation irregularities and to prevent the legal time from drifting with respect to day and night. The International Earth Rotation Service (IERS) is in charge of this time-keeping. These adjustments require introduction of leap seconds, which means some days are not 86400 seconds long. UT1 is a time scale directly linked to the actual rotation of the Earth. It is an irregular scale, reflecting Earth’s irregular rotation rate. The offset between UT1 and UTCScale is found in the Earth Orientation Parameters published by IERS. Coordinate time at the center of mass of the Earth. 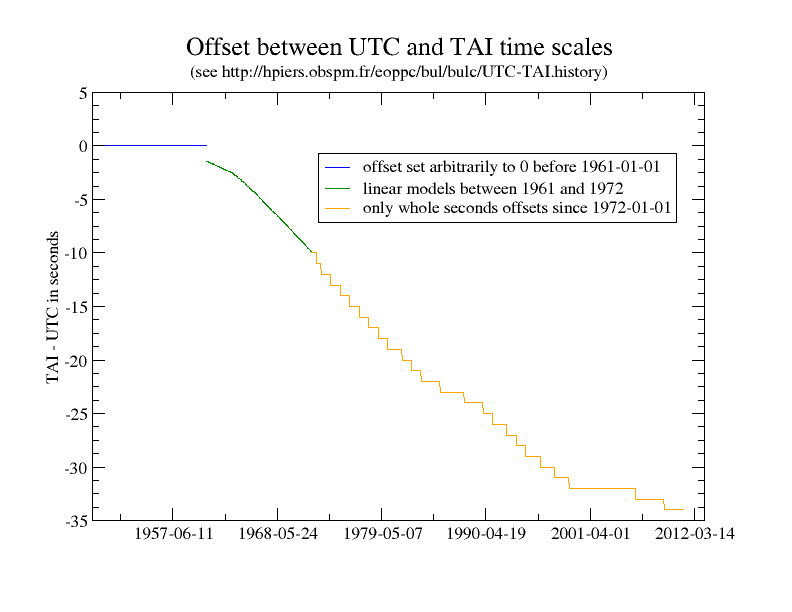 This time scale depends linearly on TTScale (and hence on TAI). time used to compute ephemerides in the solar system. This time is offset with respect to TT by small relativistic corrections due to Earth motion. coordinate time used for computations in the solar system. This time scale depends linearly on TDBScale. this scale was equal to UTC at start of the GPS Epoch when UTC was 19 seconds behind TAI, and has stayed parallel to TAI since then (i.e. UTC is now offset from GPS due to leap seconds). TGPS = TAI - 19 s.
the Greenwich Mean Sidereal Time is the hour angle between the meridian of Greenwich and mean equinox of date at 0h UT1. Orekit supports both the linear models of UTC-TAI offsets used between 1961 and 1972 and the constant models with only whole seconds offsets (and leap seconds) used since 1972. The following figure shows the offset history up to 2010. The first option is the more straightforward one, but is not sufficient for some needs. The two last options are confusingly similar, because of the complexity of time scales. Understanding the differences between the two is key to avoiding large errors. An apparent seconds offset is the difference between two readings on a clock synchronized with a time scale. If for example the first reading is 23:59:59 and the second reading is 00:00:00, the the apparent seconds offset is 1 second. An elapsed duration is the count of seconds that could be measured by a stop watch started at the first instant and stopped at the second instant. Most of the time, both times are identical. However, if the time scale is UTC and if the readings are made when a leap second is introduced, then the elapsed time between the two events is 2 seconds and not 1 second! The two variables date1 and date2 represent the same instant. The first one has been defined relative to a time scale, the second one has been defined independently of any time scale. Classes that include a date implement the TimeStamped interface. 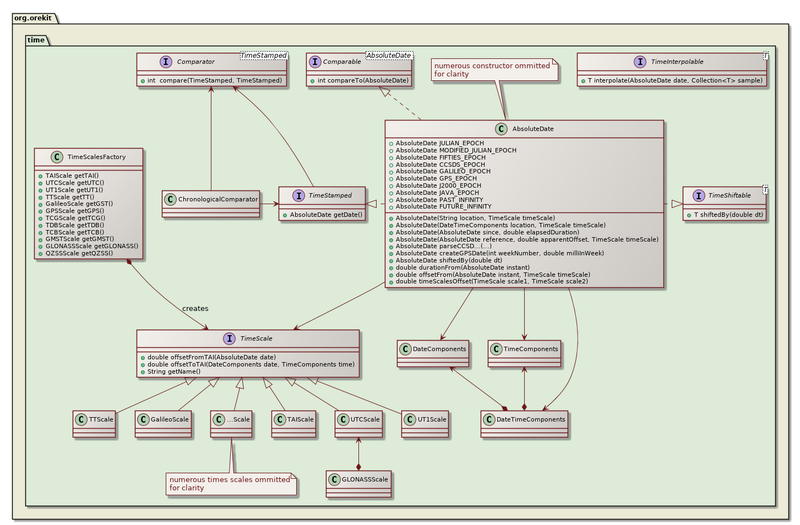 The ChronologicalComparator singleton can sort objects implementing this interface chronologically. This is particularly interesting for ephemerides. One trick that can be used for such collections is to actually define them using generic TimeStamped instances as in the following example. The trick is that we want to be allowed to use AbsoluteDate instances in methods like headSet, tailSet or subSet. Lots of space flight dynamics objects are date related (dates themselves, of course, but also attitudes, orbits, position-velocity coordinates or spacecraft states). In some cases, it is useful to be able to slightly shift these objects by very small time offsets, for example when computing finite differences. In these cases, it would be cumbersome to be forced to set up complete propagation models. The time package provide a simple parameterized interface: TimeShiftable which defines a single shiftedBy method that should be implemented by classes allowing such small shifts. The method returns a new instance shifted in time without changing the original object. This feature should not be used for large shifts where complex propagation models are needed.